Starting on the world details. I've added (but not implemented) a world log based on the ship. The world log will allow you to add notes specific to that world and that ship. 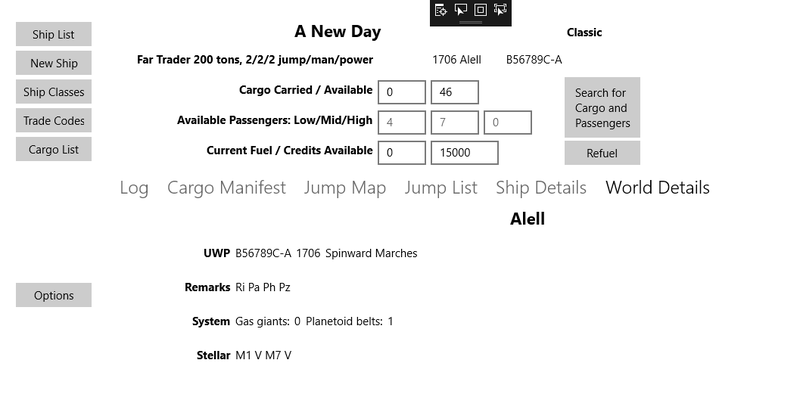 The logs will probably list all the ship notes for that world, but maybe I'll add a filter. This is more oriented towards a referee so the more data the better perhaps. Eventually I do need to address the UI. I want to make it more science fiction like. I also need to set the options to at least let me remove the sector & world data: I've just been resetting the DB so that next time I load a sector, it will add all the systems from the TravellerMap API into the DB so we've a local copy and I don't keep hitting that API. But my parsing has been a bit off despite it being a fixed width file.